The greater Washington, DC area literary community in partnership with The George Washington University presents A SPLENDID WAKE 3, the 3rd annual public program celebrating Poetry in the Nation’s Capital from 1900 to the Present, Friday, March 20th, 2015, from 6:30-8:30 P.M. at The George Washington University Gelman Library, Suite 702, 2130 H Street, N.W., Washington, D.C. (near Foggy Bottom Metro stop). Free and open to the public. 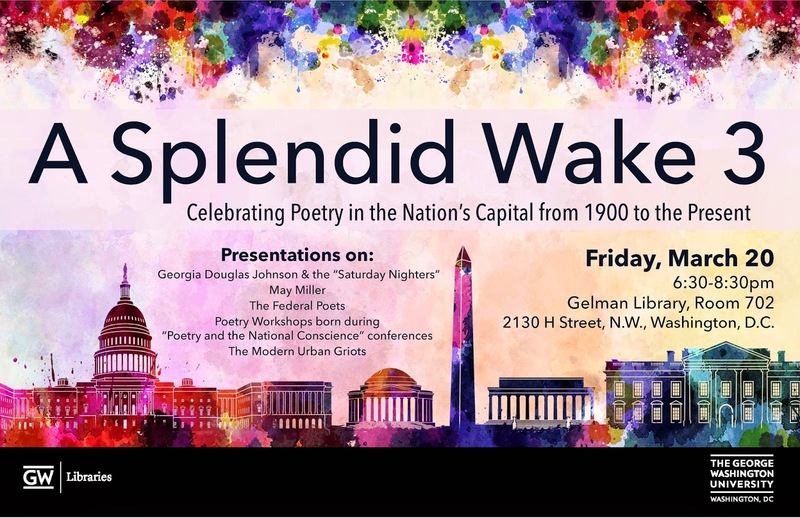 Join us as we continue our work of documenting poets and poetry movements in the Nation’s Capital from 1900 to the present. Our focus this vernal equinox is on Georgia Douglas Johnson and the Saturday Nighters, poet May Miller, the Federal Poets, Poetry Workshops born during “Poetry and the National Conscience” conferences, and the Modern Urban Griots. Presenters include: Regie Cabico: Host; Kim Roberts and Michon Boston on Georgia Douglas Johnson and the Saturday Nighters; Miller Newman on May Miller; Judith McCombs on the Federal Poets with Donald Illich and Doritt Carroll; Linda Pastan and Rod Jellema on poetry workshops with Siv Cedering, Primus St. John, Roland Flint, and others; and Toni Asante Lightfoot on Modern Urban Griots with Brandon D. Johnson, Holly Bass and Twain Dooley. The public is invited. NO TICKETS ARE NEEDED.